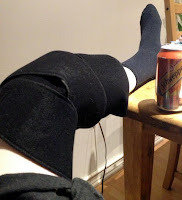 Triathletes Journey: A "He said, She said" reporting on races and events: The mystery of the wonky knee..
Elle: A little history: About a year and half ago I was (probably) over training. I did a tough Sufferfest bike workout in the morning, and then a hard speed workout on the track after work. The next day I woke up and couldn't bend my left knee. I had never had knee problems before, this was a first. My doctor took a look, ruled out any major problems, and told me to rest for a month. Which I did. Then back to training. I had another episode in January 2012. Over the next year and a half I saw two physical therapists. I rested, I did PT exercises, I stretched, I rolled, I saw a chiropractor twice a week. And spent a full season doing races, wrapping it up with a 1/2 Ironman. Then, at Thanksgiving, I did a 4-mile run: 2 miles downhill, then 2 miles back up the hill. After that, everything went to crap. The pain in my knee got increasingly worse. In the morning it wouldn't hurt, but by the end of the day, I'd be limping. And after six months of going to the chiropractor's office one to two times a week, even he said it was time to get imaging. The x-rays showed nothing. The MRI, however, was a different story. And finally I had an answer - the MRI showed a torn meniscus and a big 'ol cyst. After much thought and discussion with the surgeon, I knew what I had to do. So I scheduled the surgery for the day after my return from Miami. I was told not to have any food or liquids (no water or anything) after midnight the evening before surgery, which was super tough. Not having food, that's no problem, but not even a sip of water? Damn. Webb was great to take the day off and was with me the whole way. We got to the hospital around 8am, and things went fairly smoothly from there. Before I knew it, I was lying in a hospital bed with an IV in my arm. I barely remember being rolled away to the operating area. And the next thing I know, I'm kind of awake, and it's all over. As I gained consciousness, a nurse would occasionally pop by to see how I was doing. And after a bit, I was rolled to the post-op area. I was pretty groggy, but anxious to get dressed and get on with things. Then the best thing happened - a woman walked over and told me I had a visitor. I assumed it was Webb, so I asked, "Is he bald and cute?" She gave me a funny look and replied, "Um, no. It's a runner. He has.... dreadlocks?" I thought for a minute, then it hit me: Shawn! I had told him a while back about the surgery, but I can't believe he remembered, and actually came to visit! Not only that, but he gave me the most beautiful 'get well' card ever. It was really great to have Shawn there, with his uber-upbeat attitude and energy, it made me feel tons better. He even stayed with me until Webb showed up, and walked with us as I was wheel-chaired through the hospital to the front doors. Webb brought the car around, I gave Shawn a big hug, and we were on our way home. That's right, I didn't get the memo that I was supposed to be totally resting my knee for about a week, so I attempted to go to work. Which resulted in a huge 'work fail'. I left pretty shortly after I arrived, and took a cab straight to my eye doctor. In my dizzy, sweaty state, I had looked in the mirror and saw that my eyes were completely funky: both super dilated, the left much more dilated than the right. Since I had iritis a couple of years back, I freaked out and went straight to Dr. Laura, at South End Eye. I walked into the shop, and Dr. Laura said, "Hey there, googly-eyes!" I love Dr. Laura. The eye exam came out fine, there was nothing wrong. Dr. Laura suggested that I probably pushed myself too much, too early, and that I should go home and rest. She was right. And I spent the rest of the week on the couch, working from home. Ten days after the surgery I had an appointment with Dr. Lars Richardson (my surgeon). He said everything was looking good, and even showed me photos that were taken during the surgery. (Super cool! I saw my patella!). Apparently I (along with 3% of the population) had a discoidal meniscus (aka, an abnormal meniscus), which they discovered once they were 'inside.' So the surgeon proceded to fix it. Which is pretty awesome. I plan on swimming this weekend, and slowly amping up my workouts. First with biking, then the elliptical trainer, and lastly - running. It's going to take some time, and I'll have to increase intensity and duration slowly, but at least now I'm on a clear path to recovery. Which feels pretty good. To a speedy recovery! Good luck. But don't rush it, I'm a victim of 3 surgeries on my knees, they take time. Follow your PT to a "t"! Hope you have 100% recovery.